I’m on a roll this holiday season sharing some of my family’s favorite recipes! From our Fannie May fudge and No Bake Cheesecake to my Cream Cheese Sugar Cookies, there is something you must like?!? Growing up, my mom ALWAYS made these cookies. I called them crescent cookies, because of the shape. They were like crescent moons. But when I say crescents now, people think of the bread. Making a batch of these, I was reminded how easy they are to make. I even created a little video again for you all (I promise my videos will get better with time)! Use Fisher Nuts Almonds! I love the flavor of their nuts, and the fact that they are preservative free! I used the Fisher Sliced Almonds, but whole almonds would work exactly the same. You’re going to pulse them in your food processor until they are a fine crumb. When shaping the dough, make them small. The smaller the better! One bite cookies are the best, haha! I use about 1 Tbsp dough, maybe a little bit less. 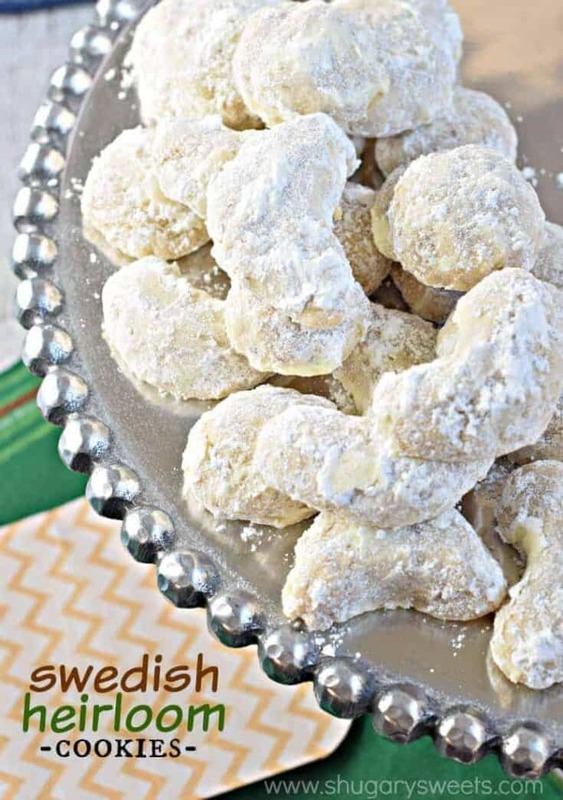 While the cookies are still warm, roll them into the bowl of powdered sugar. Once they are cooled, sprinkle even more powdered sugar on them, you want to inhale the powdered sugar till you cough. Kidding. But you know it happens. Store these cookies in an airtight container for up to one week! What kinds of food does your family make every year? Are you looking to start your own holiday traditions? 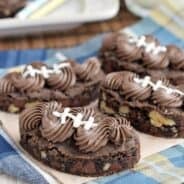 Be sure to check out Fisher Nuts Pinterest page as well as their website for more delicious recipes! 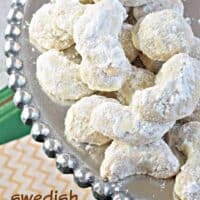 Snowball Cookies or Swedish Heirloom Cookies are delicious, buttery cookies packed with almonds or pecans and rolled in powdered sugar. In a large mixing bowl, cream together the butter, powdered sugar and salt until smooth. Add in ground almonds, flour and egg. Slowly add water, vanilla, and almond extract. Beat until combined into a dough. Shape dough into small balls and crescents, using about 1/2-1 Tbsp of dough. Place on cookie sheet. Bake for 12-14 minutes, until set. While warm, roll cookies in powdered sugar. Store in airtight container for up to one week. Add more powdered sugar, if needed, when serving. 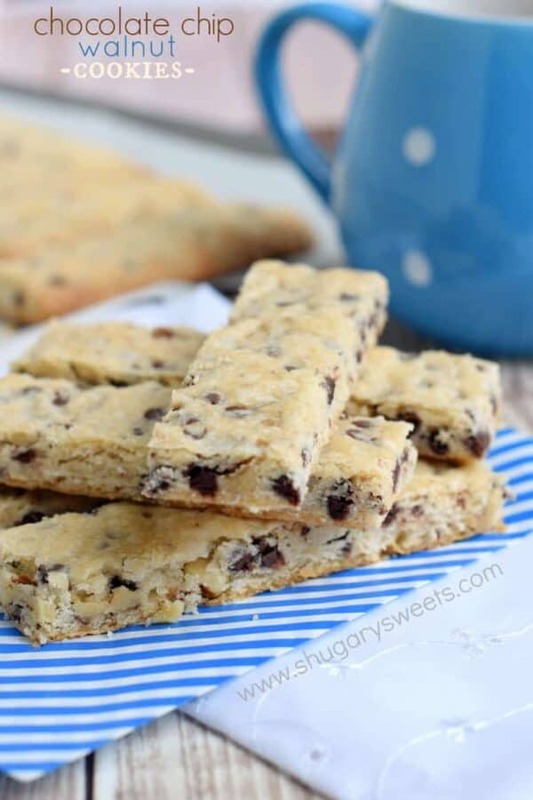 Chocolate Chip Walnut Cookies: these shortbread sticks are PACKED with nutty flavor! 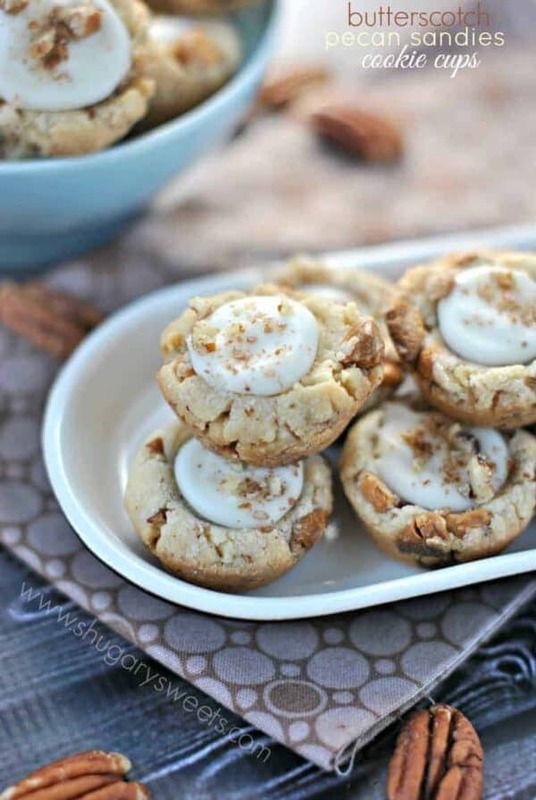 Butterscotch Cookie Cups: these butterscotch pecan sandies are one of my favorite cookies for a holiday exchange! 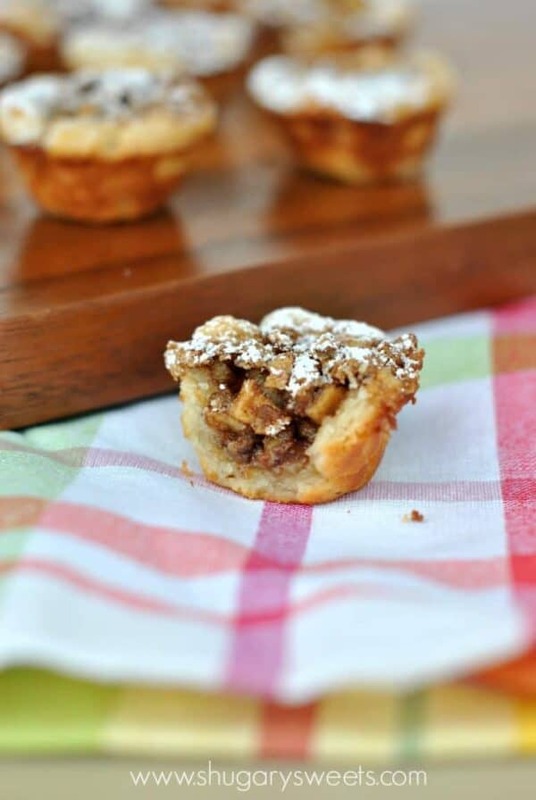 Apple Pecan Nut Cups: another family favorite! Aimee, I just posted a video with the EXACT same music!!! Aaaaah. We’re so connected. But yours is definitely better. I’m learning as I go! And these are my favorite cookies. Love them all the time, all year. That texture can’t be beat! I knew your video music sounded familiar 😉 Learn as you go…that’s my motto! I have eaten these cookies before, but never knew what they were called. Looks delicious! These cookies would be gone in minutes if I made them!! So, so delicious!! I love cookies like this! They almost melt in your mouth. 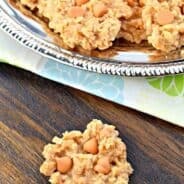 These are such a fun holiday cookie to eat with coffee! Love the fun video showing how to shape them! I have never used ground almonds in them before, but such a good idea. I usually use chopped pecans. I also have a version with orange peel.. They too are yummy. 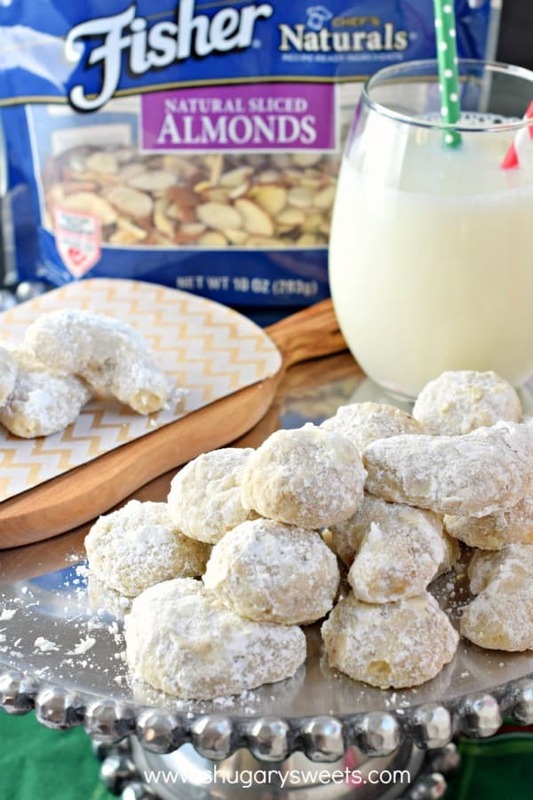 I think the almonds gives more flavor, but I have used pecans and walnuts too! How would you recommend freezing these? 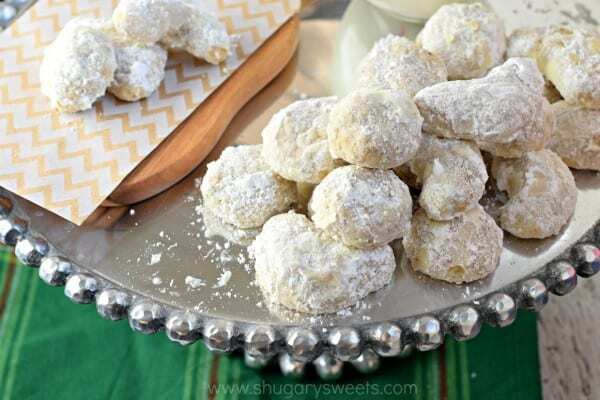 These cookies hold the powdered sugar MUCH better if you wait until they cool to roll the in it. Also, rolling them 2 or3 times makes them even more fabulous. And don’t even THINK of using margarine! Also, my recipe has 4 ingredients and none of them is egg, water or almond extract…. can they get to old to eat.i have some that are at least 3 wks old. Is the almonds supposed to be measured before or after grounded? Growing up my mother always made these. She used Crisco instead of margarine. They are wonderful. 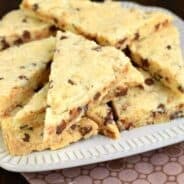 My grandma was Lithauanian, we called them Russian tea cakes. I’d forgotten we’d make both shapes: crescent and balls. They were her favorite alongside Oreos that were invented about the time she was born. Thanks for sharing!